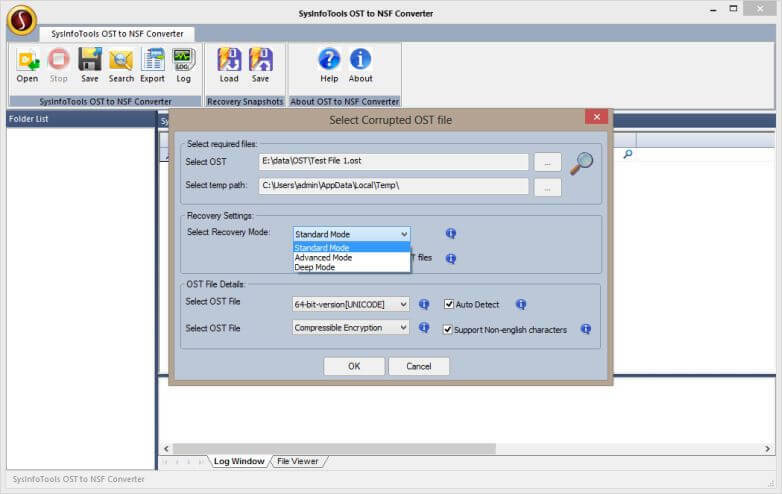 OST to NSF conversion has become an easy task with the help of SysInfo OST to NSF Converter Tool. This software is designed and developed with an advanced algorithm that can effectively export Exchange Outlook to Lotus Notes. This works so conveniently that it convert OST to NSF file whether your OST file is corrupt, damaged or inaccessible. OST to NSF Converter is smartly built with the user-friendly GUI by which technical or non-technical user can easily understand and import OST files to IBM Notes. The scanning modes allow users to select the modes from standard, advanced and deep mode as per the corruption level in their OST files. While conversion of Exchange Outlook to Lotus Notes software undergoes deep scanning and recover complete OST file details which are available for users to have a preview. Users can save the recovered OST files either in existing NSF file or can create new NSF file. SysInfo OST to NSF Converter tool generates the log file which includes entire information of the recovered data in detail. Also, it allows users to save log file in HTML or TXT format at user defined location. This software allows users to open OST in Lotus Notes without any data loss. It is completely safe and secure tool which change OST to NSF format smoothly and securely within no time. This software is highly compatible with all versions of windows based operating system. Try its free demo version and convert OST to NSF file now, also get an idea before purchasing its full version.